Tuesday, 22 January 2019, 1:56p.m. Five people have been injured, two critically and one seriously, after a large tree fell on a group of people at Queenstown's Shotover Jet base. A witness saw a child being loaded into a chopper and a St John spokesman said three helicopters and multiple ambulances attended the scene. 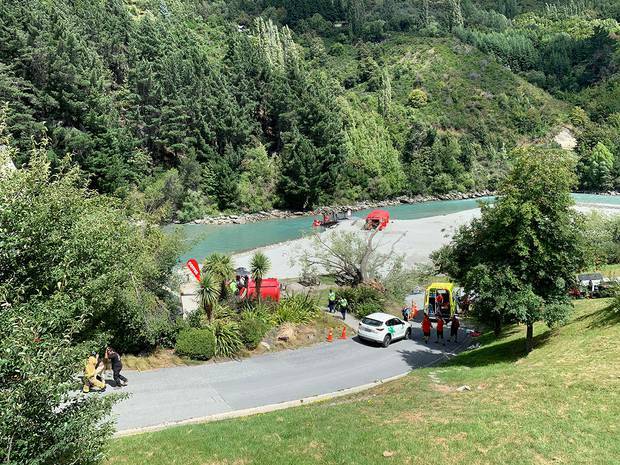 Ngāi Tahu Tourism runs the Shotover jet and its spokeswoman Kirsty Phillips said the tree had fallen on the bank of the Shotover River, injuring five people who were sitting underneath it. "All are believed to be conscious ... they are being assessed by emergency services and will be taken to hospital. The wellbeing of individuals is paramount and our focus is on supporting them, their whānau and our team". A reporter at the scene said the large tree, which was beside the outdoor café area at the Shotover base , had fallen over with is roots completely ripped out. As well as the child taken in the chopper, the reporter said it looked like another child and an adult female had also been hurt. "One guy was absolutely beside himself. The fire brigade and police had to hold him down basically," he said. The Otago Daily Times reporter said it was "really windy" and gusts were blowing up dust across the site. "You can barely stand up when a gust comes. You are pretty much cowering to the ground," he said. Another person at the scene has described it as "absolute chaos" after the tree came down. The Shotover base has been completely locked-down. A group of people coming back from a boat ride have been directed past the fallen tree. A police spokeswoman said emergency services were called to an incident at 1pm. A severe weather watch for northwest gales is currently in place in Central Otago and Southern Lakes. The watch is in place from 1pm until 6am tomorrow and westerly winds may rise to severe gale in exposed places. Metservice meteorologist Lisa Murray said observations at Queenstown Airport have shown mean wind speeds of 20km/h with gusts up to 52km/h. Murray said there were places that could be more exposed to wind gusts that weren't under official observation.